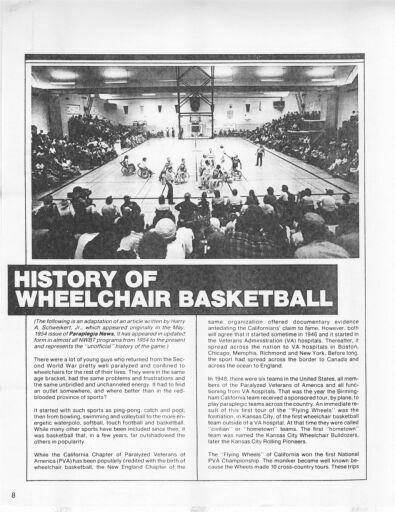 Digital Surrogates from the Rehabilitation Education Services Wheelchair Athletics Records, 1980, contain newspaper clippings, reports, academic articles, correspondence and statements, concerning the history and evolution of wheelchair, and wheelchair athletics at UIUC. Major contributors include Professor Timothy J. Nugent, Director of Rehabilitation Education Services, and the Rehabilitation Education Center. The Rehabilitation Education Services Wheelchair Athletics Records (Digital Surrogates), 1980 are managed by the University of Illinois Archives and do not feature precise descriptive information for each item. Discover their contents by browsing the folders and files. For more information, contact an archivist at illiarch@illinois.edu.